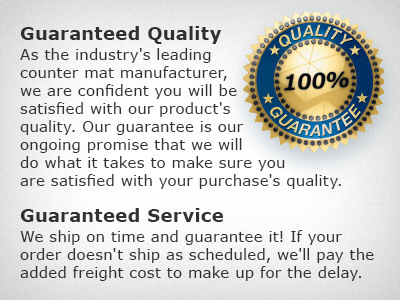 With its laser focus and outstanding service, the Las Vegas-based mouse pad manufacturer reigns supreme in 2019. At their first industry tradeshow, some two decades ago, the team at Digispec (asi/49716) instantly put themselves on the map. Decked out in denim shirts and blue jeans with a red rag in the back pocket, the mouse pad manufacturers looked like they belonged on a Bruce Springsteen album cover. Their blue-collar image struck a chord with distributors, opening the lines of communication with many potential clients. From there, company founder and president Ed Hamilton credits his employees’ ingenuity, endless dedication and outstanding service to maintaining those client relationships ever since. Those attributes are a huge factor in why Digispec is Counselor’s Supplier of the Year for 2019. While serving in the U.S. Air Force, Hamilton studied finance operations and art before getting his MBA in organizational behavior at Utah State University. He went to work for the Kimberly-Clark Corporation, dabbling between the accounting department and production side. Interested in technology, Hamilton describes himself as “engineer-like,” preferring to write software and design computer systems. He decided to scratch the tech itch by starting H&H Enterprises in his California garage in 1983. The company made computer novelty products such as The Friendly Computer Bug, a lapel pin made from integrated circuit with googly eyes and a tail. As the decade went on, Apple began distributing mouse pads, propelling the item into the mainstream. Hamilton hopped on the bandwagon and never looked back. Hamilton launched Digispec in 1997 with this tagline: “When you think of mouse pads…think of Digispec.” Relying upon cutting-edge, state-of-the-art equipment and American-made materials, Digispec quickly dominated the promo mouse pad space. By 2003, the company purchased its two largest competitors: Minneapolis-based XJD Corp and Utah-based DataPad. As a result, Digispec became the largest mouse pad manufacturer in the promotional products industry. In order to capitalize on the company’s growth, Hamilton launched CounterPoint – a point-of-purchase counter mat manufacturer – in 2001 and Visstun – a promotional drinkware producer – in 2006. All three companies are part of Hamilton’s Time’s Up, Inc. Each division operates independently, but all three are headquartered in Las Vegas. Monique Favreau sure hasn’t looked anywhere else since joining H&H Enterprises in 1996. Originally hired as Hamilton’s assistant, she never actually filled that role because the first day that her boss walked in with CRM software, Favreau jumped at the chance to get involved with sales and marketing. Digispec runs on a computer program that Hamilton wrote himself. A strong believer in manual as well as computer systems, his goal is to ensure that distributors receive the same quality service every time, eventually establishing reliability. The systems are clearly working because ASI data shows distributors rank Digispec toward the head of the pack when it comes to everything from service and product quality to conflict resolution and communication. Another longtime distributor client – Joseph Miller, co-owner of Florida-based AiA LogoTools (asi/444130) – is in full agreement. “They make it easy, communication is good, service is good, they don’t miss deadlines and the overall quality of service is great,” Miller says. To win such positive reviews it takes both terrific employees and an excellent culture. Hamilton, who has six kids and 13 grandkids, treats his employees as extended family, fostering a casual, laid-back environment. Everybody wears blue jeans to work – no ties allowed. Back in the day, if somebody showed up to work in a suit and tie, they had to drive around the parking lot in a little scooter.